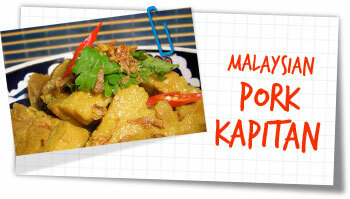 This is an alternative recipe for one of my favourite Malaysian curries. I would normally eat it with chicken, but pork works equally well so you choose. The vivid colour is so appealing – and the taste is so utterly delicious that I just can’t stop my urge to pile my bowl in a disgraceful heap of meat and sauce. Blend together all the paste ingredients into a semi smooth paste in a pestle & mortar or food processor. Heat the oil in a large pan over a moderate heat. Fry the curry paste and cinnamon sticks for 1-2 minutes until fragrant. Add the pork and fry for 1-2 minutes more. Pour in the coconut milk and stock along with the sugar, salt, pepper and tamarind. Stir then bring to a simmer. Reduce the heat to low then gently simmer with the lid on for 1 1/2 hours until tender. Serve over rice with a sprinkling of coriander and crispy onions.